The Reproductive Process - "Stages of the Reproductive Process"
Stage I: The production of healthy spermatozoa by the man and healthy ova by the woman. 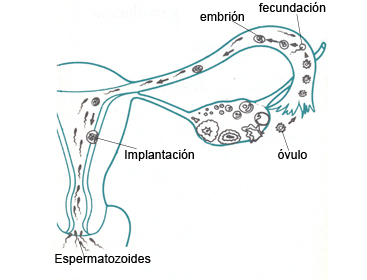 Stage II: The woman having unobstructed Fallopian tubes which allow the sperm to reach the egg. Stage III: Once the sperm meets the egg the former must be capable of fertilising the latter. Stage IV: That this fertilisation produces a genetically healthy embryo. Stage V: This genetically healthy embryo must be capable of becoming implanted in the woman’s uterus. Reproduction in humans is quite an inefficient process. In a normal cycle for a fertile couple, the chance of an egg being fertilised naturally by a sperm in the female reproductive system can be around 60% - 70%. After fertilisation, many of these embryos are lost, mainly due to some sort of anomaly which prevents them from surviving and becoming implanted in the woman’s uterus; in fact, in the majority of cases women are not aware that they have lost an early pregnancy, as their period will not necessarily be late. When pregnancy is not achieved in a menstrual cycle it means that the reproductive process has been interrupted during one of these five steps. If the woman’s period is late and she is aware of being pregnant, in approximately 25% of cases she will experience some sort of problem during the pregnancy, which will not survive to full term. Various clinical studies have attempted to calculate the chances of becoming pregnant for population groups which do not use contraceptives. These indicate that the probability is approximately 20% in any menstrual cycle, and that this probability decreases as women get older.